Read small, thought-provoking portions of Dallas Willard’s Hearing God and be guided in ways to pray, meditate or reflect– to position yourself to allow God’s voice to shape you. This book is an invitation to learn to pray and listen to God more deeply so that you can conform your will to his. As you begin your journey through the year, talk to God about your motives for reading this book. Thank him that you don’t have to earn his approval. Tell him about your desire to grow, and thank him for promising to meet you. At the bottom of each page is an activity that gives you a place to start in responding to the Scripture and accompanying thoughts. That activity may be to reflect, to pray or to meditate. Responding to what God has said to you in the daily meditation is always important. Simply reading something will have little effect on you. The suggestion is just a place to start, however, and you may find yourself praying about what you reflected on, and times of meditation should usually end in prayer too. Beyond that, you may feel led to journal. Especially if the reflection raises confusion within you, it can be helpful to write your thoughts down on paper. Also, some prayers are better written in a journal because you need to be as concrete as possible in your ideas. And sometimes God will speak to you through reflection and meditation in a way that’s so downright stunning that these thoughts should be recorded and read for several days. These devotions are not dated; you can start anywhere and move around as you please. 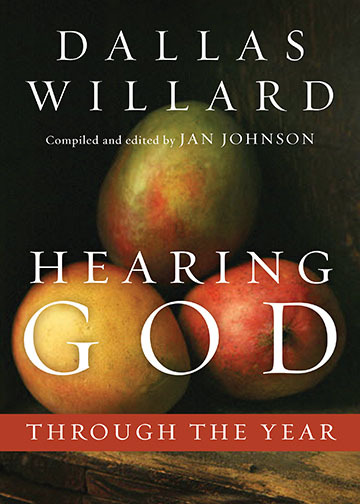 The devotions are adapted from Hearing God by Dallas Willard. If you want to read more on these themes, you may want to look for his book. You’ll find a year’s worth of devotions here, designed to fill six days a week. We choose to offer six rather than seven for a built-in bit of grace as circumstances do sometimes infringe on our devotional time. But you can use the seventh day to go back to some of the “pray,” “journal” and “apply” suggestions you’ll find at the end of the devotion. We pray that as you read these devotions and reflect on God’s word, you will be able to hear God and to allow his voice to shape your choices and encourage your heart. People are meant to live in an ongoing conversation with God, speaking and being spoken to by God. God’s visits to Adam and Eve in the Garden, Enoch’s walks with God and the face-to-face conversations between Moses and Jehovah are all commonly regarded as highly exceptional moments in the religious history of humankind. Talk with God about the idea of having ongoing conversation. Tell God what truths you most need to hear from him regularly. Ask God to show you circumstances and places in which this conversation might occur most easily (praying, gardening, exercising, mowing a lawn or cleaning house). We all knew that Mema had a richly interactive life with God, so her question was not a sign of weak faith or rebellion. Worse yet, we could not explain how we knew when God was speaking. I was caught up in my own experiences of the workings of God’s voice, but I did not understand it. I knew only its reality, and I thoughtlessly assumed this was a functioning, intelligible fact in every believer’s life. Understanding that we hear God and how it happens is important so that our confidence is not undermined that we are fully acceptable to God. Where are you in the process of understanding how God speaks to you? If you believe you’ve heard God in your life, how did you know that? Why might you have discounted times God spoke to you? Ask God for guidance in pondering this. In his book Confessions, St. Augustine tells how in a distraught condition he “heard from a neighboring house a voice, as of boy or girl, I know not, chanting, and oft repeating, `Take up and read. Take up and read.’ ” He could remember no child’s game with these words. In tears, “I arose; interpreting it to be no other than a command from God, to open the book, and read the first chapter I should find.” He opened to verses that addressed his exact condition (Rom 13:13-14), which was immediately transformed. The writings of great Christians of the past such as John Calvin and William Law help us identify and respond to experiences of God’s speaking, just as Eli helped Samuel. They assure us that the same Spirit who delivered the Scriptures to holy men of old speak today in the hearts of those who gather around the written Word to teach and to learn. They warn us that only if this speaking occurs can we avoid being letter-learned scribes–trying to nourish others’ souls out of our own brain, giving them only what we can work up through our own efforts. List people you could talk to about how they hear God in their lives. Don’t dismiss folks who are quiet but communicate a calm sense of the presence of God. Choose one who would be easiest to talk to and approach that person. Hearing God? Some would say that’s a presumptuous and even dangerous idea. But should we expect anything else, given the words of Scripture and the heritage of the Christian church? As Christians we stand in a millennia-long tradition of humans who have been addressed by God. The ancient Israelites heard the voice of their God speaking to them out of the midst of fire (Deut 4:33). A regular place of communion and conversational interchange between the high priest and God was established in the mercy seat over the ark of God (Ex 25:22; Lk 1:11-21). But the individual with faith among the Israelites also cried out expectantly to be taught by God (Ps 143:10). Isaiah had firsthand experience of conversing with God (Is 6) described this process this way: “Then you shall call, and the LORD will answer; you shall cry for help, and he will say, Here I am. . . . The LORD will guide you continually” (Is 58:9, 11, NRSV). On the evening before his crucifixion, Jesus assured his little band of followers that although he was leaving them, he would continue to show himself to all who loved him. Judas Thaddaeus then asked just the right question: How would this manifesting take place (Jn 14:22, NRSV)? Jesus replied that he and his Father would “come to them and make our home with them” (14:23). The abiding of the Son and the Father in the faithful heart involves more than communication or conversation, but it surely does involve these too, in a manner and measure our Lord considers to be appropriate. It is simply beyond belief that two persons so intimately related as indicated in Jesus’ answer would not speak explicitly to one another. The Spirit who inhabits us is not mute, restricting himself to an occasional nudge, a brilliant image or a case of goosebumps. Reread John 14:23 aloud slowly. Shut your eyes and savor the idea of “home.” Why would God want to make a home in creatures such as we? Why would you want to have God make a home in you? What does this make you want to say to God? Sometimes today it seems that our personal relationship with God is treated as a long-distance arrangement in which Jesus and his Father listen to us from afar – maybe nodding and smiling. In heaven, each believer has a “sin” account, which God keeps wiping clean as Christ’s death pays each believer’s sin bill. But doesn’t a personal relationship involve more than that? A mere benefactor, however powerful, kind, and thoughtful, is not the same thing as a friend. Jesus says, “I have called you friends” (Jn 15:15) and “Look, I am with you every minute, even to the end of the age” (Mt 28:20, paraphrase). It’s reasonable to assume that this personal relationship of friends would include individualized communication – words and ideas God communicates uniquely to each friend. Slowly reread Hebrews 13:5 or another verse printed on this page. Say it aloud to yourself and pause. What word stands out to you? Pause again. Why do you think that word stood out? What might God be trying to say to you to you today?